Detectives hunting armed robbers are using a journalism student’s video footage in a bid to catch the gang. Katia Damborsky, who studies at the University of Brighton, caught a knifeman and his accomplice preparing for an attack which saw them take £10,000 from a post office in the city. Footage of the daylight raid was caught by Katia’s home CCTV system, and the footage has now been passed to Sussex Police detectives. 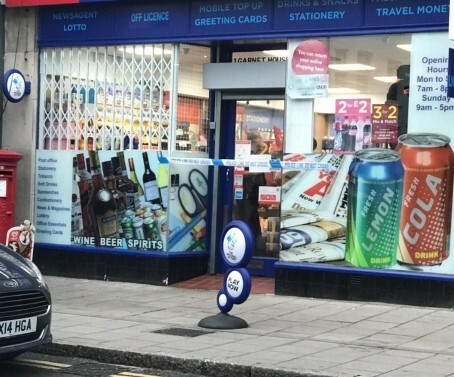 One of the robbers held a knife to the rib of a shop worker and demanded cash, while the other guarded the door. Katia, 21, told Brighton daily The Argus: “[On the CCTV] you can see the two men standing outside the shop for five minutes. One of them even took a phone call as he loitered about. They kept looking in the window to check if the shop was empty or not. “Then a guy a white jeans went into the post office, while a man in the red tracksuit guarded the door. I spoke to a staff member in the shop and they said the raiders nodded at each other. That’s when the till lady knew it was a robbery. “They said a knife was held against the the lady’s ribs. When I walked to the post office I saw crime scene tape across the door. Good to see she’s mastered the “you don’t expect it to happen here” quote already. A successful career beckons!